This website is the online center for public information for the designated Section 368 Energy Corridors. The Bureau of Land Management, the U.S. Forest Service, and the Department of Energy hosted a webinar on February 27th regarding Regions 4, 5, and 6 energy corridor abstracts. A recording of the webinar is available below. The Bureau of Land Management (BLM), the U.S. Forest Service (USFS), and the Department of Energy (DOE) have released Regions 4, 5, and 6 draft corridor abstracts, available on the Regions 4, 5, and 6 Regional Review page, and are requesting input through April 8, 2019. 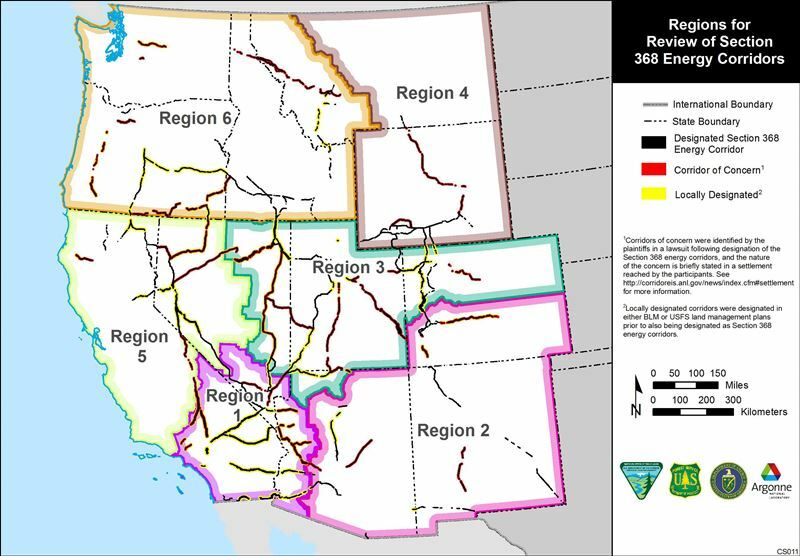 A Section 368 energy corridor regional review status webinar for Regions 2 and 3 was held on July 18, 2018, at 11 am MDT. The webinar focused on the recent workshops held in New Mexico, Arizona, Nevada, Colorado, and Utah. A recording of the webinar is available below. The summary of Regions 2 and 3 workshops is now available. The summary was reviewed during the July 18 webinar, available for viewing above. The National Renewable Energy Laboratory (NREL) report "Energy Futures Synthesis for West-wide Section 368 Energy Corridors" has been released. The report offers a glimpse of Western U.S. energy transmission needs 10 to 15 years in the future. Section 368 of the Energy Policy Act of 2005 (the Act), Public Law 109-58 (H.R. 6), enacted August 8, 2005, directed the Secretaries of Agriculture, Commerce, Defense, Energy, and the Interior to designate under their respective authorities corridors on federal land in 11 Western States (Arizona, California, Colorado, Idaho, Montana, Nevada, New Mexico, Oregon, Utah, Washington, and Wyoming) for oil, gas, and hydrogen pipelines and electricity transmission and distribution facilities (energy corridors). The Bureau of Land Management (BLM), U.S. Department of Energy (DOE), U.S. Forest Service (USFS), U.S. Department of Defense (DoD), and the U.S. Fish and Wildlife Service (USFWS) issued a Draft Programmatic Environmental Impact Statement (PEIS) on November 16, 2007 and a Final PEIS on November 20, 2008 that evaluated issues associated with the designation of energy corridors on federal lands in eleven Western states. The PEIS identified potential corridors; evaluated effects of potential future development within designated corridors; identified mitigation measures for such effects; and developed Interagency Operating Procedures (IOPs) applicable to planning, construction, operation, and decommissioning of future projects within the corridors. Based upon the information and analyses developed in the PEIS, the Secretaries of the Interior and Agriculture signed Records of Decision (RODs) in 2009 designating Section 368 energy corridors by amending land and resource management plans on lands administered by their respective agencies in the eleven Western states. The designation of energy transport corridors in land and resource management plans identified the preferred locations for development of energy transport projects on lands administered by the USFS and BLM. These locations were selected to avoid significant known resource and environmental conflicts, promote renewable energy development in the West, improve reliability, relieve congestion, and enhance the capability of the national grid to deliver electricity. The IOPs are intended to expedite the permitting process; provide coordinated, consistent interagency management procedures for permitting rights of way (ROWs) within the corridors; and identify mandatory requirements for future projects. The evaluation of future project-related environmental impacts must await site-specific proposals and the required site-specific environmental review. A quantifiable and accurate evaluation of impacts at the local project level can be made only in response to an actual proposed energy project, when a proposal for an action with specific environmental consequences exists. In July 2009, the Wilderness Society, BARK, Center for Biological Diversity, Defenders of Wildlife, Great Old Broads for Wilderness, Klamath-Siskiyou Wildlands Center, National Parks Conservation Association, National Trust for Historic Preservation, Natural Resources Defense Council, Oregon Natural Desert Association, Sierra Club, Southern Utah Wilderness Alliance, Western Resource Advocates, Western Watersheds Project, and County of San Miguel, Colorado (Plaintiffs) filed a complaint against the Agencies challenging the PEIS, DOI and USFS RODs, and associated Section 368 energy corridor designations (Wilderness Society, et al. v. United States Department of the Interior, et al., No. 3:09-cv-03048-JW [N.D. Cal.]) pursuant to the Energy Policy Act, National Environmental Policy Act, Endangered Species Act, and the Federal Land Policy and Management Act. In July 2012, the BLM, USFS, Department of Energy (DOE), and the Department of Justice entered into a Settlement Agreement with the Plaintiffs that contains specific actions to resolve the challenges in the Complaint. The Settlement Agreement also identifies specific Section 368 "corridors of concern." For more information about the Settlement Agreement, including timeline, documents, implementation of periodic reviews, agency guidance and training, and the corridor study, see the Settlement Agreement page.